Shakshuka is a spicy tomato and poached egg dish originally from North Africa. It is now popular all over the Middle East and has made it's way to America, too. 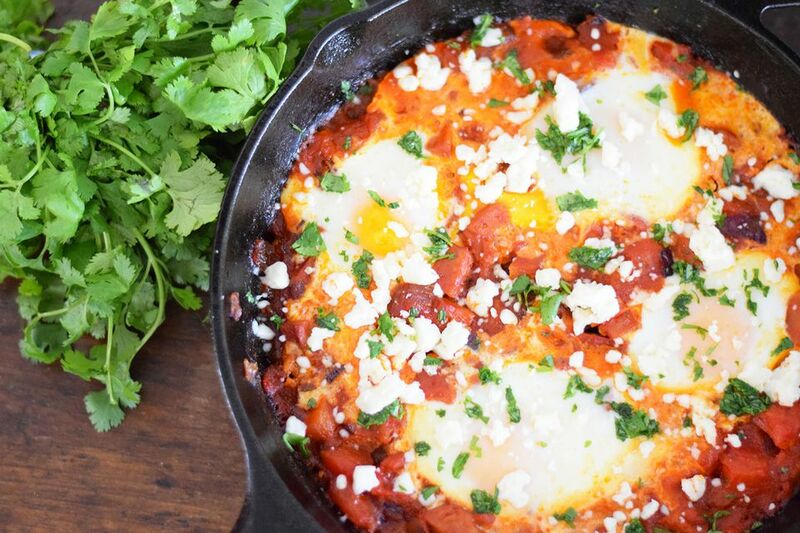 This is a delicious, spicy Mexican version using fresh eggs, chorizo, Cotija cheese, and cilantro. The eggs are nestled in a bed of spicy tomatoes and cooked to perfection in the oven. It is ridiculously easy to make Shakshuka and to clean it up. It requires the use of one cutting board and one pan. It is a great family style brunch dish. Depending on the size of your pan you can make this dish for a large party of people too. Serve up this savory egg dish with a large chunk of crusty bread or any kind of toast you have on hand. It is perfect for dipping into the spicy tomato sauce. The chorizo adds lots of great flavor to the dish. You can replace it with another sausage if you wish or add spices such as cumin to the tomatoes. In a large cast iron skillet heat 1 tablespoon of olive oil to medium-high heat. Add the diced onion and cook until soft, about five minutes. Add the crumbled chorizo sausage and cook until completely browned. Drain excess oil if you wish, depending on how much fat was in the sausage. Leaving some of the fat will add a lot of flavor to the dish! Add the diced tomatoes, tomato sauce, salt, and cayenne powder to the skillet. Stir and cook for about 10 minutes on medium heat, until the tomatoes have been softened and the flavors have had a chance to blend. Stir the mixture occasionally. You can cook this for longer if you wish. Make four wells in the tomatoes. Crack one egg into each well. Remove the skillet from the stove and place in your preheated oven on a middle rack. Cook for about 10 minutes, or until the eggs have reached your desired doneness. The shorter the time the runnier the yolk. Remove the skillet from the oven. Crumble the Cotija cheese over the top of the eggs. Sprinkle with the finely chopped fresh cilantro and serve immediately. Thick, crusty, toasted bread will complement the eggs perfectly!